JOHNSBURG -- A certified nurse's aide was arrested Thursday on charges that accuse her of abusing a 98-year-old woman at Adirondack Tri-County Nursing home, officials said. Brenda L. Hayes, 48, of Pottersville, was charged with misdemeanor counts of endangering the welfare of an incompetent person and willful violation of health laws after an investigation by the state Attorney General's Office, police records show. The victim was a resident of the home who suffered from dementia, according to court records. Hayes was charged in connection with an incident that a registered nurse witnessed at the nursing home on July 27, according to court records. According to an affidavit given by a nurse manager, identified as Lisa LaFountain, Hayes was heard yelling at the resident, and when LaFountain went to investigate the yelling, she witnessed Hayes grabbing the woman by the arms and pulling her as she sat on a toilet. The victim suffered bruises to both arms, according to court records. Hayes had alleged the woman spit on her, and she told LaFountain, "No one has the right to spit on us," according to court records. Hayes was arrested by State Police and was released pending prosecution in Johnsburg Town Court. Hal Payne, administrator of the home, said Hayes was suspended within an hour of the incident and was formally terminated on Aug. 4. The state Health Department was notified immediately, Payne said. "This is not acceptable behavior and will not be tolerated," he said. The victim continues to live at the home, he said. Hayes has been a state-certified CNA since 2001. Despite the five-month investigation and arrest, Hayes continues to be registered with the state as a certified nurse's aide. The state website registry lists her last employer as Adirondack Tri-County Nursing Home. Jeffrey Hammond, a spokesman for the state Department of Health, said a CNA can have his or her certification taken away for disciplinary violations. "If she is convicted, it will be reflected in the registry," he said. The state's CNA registry can be found at registry.prometric.com/registry/public. SALT LAKE CITY (ABC 4 News) - Our exclusive ABC taking action 4 you investigation is uncovering new information about your safety inside hospitals. Dangerous viruses and bacteria infect 1.7 million patients and kill 99,000 people every year, according to the Centers for Disease Control and Prevention. At least one-third of these deaths are preventable, according to the National Conference of State Legislatures. "This is a huge public health problem," said Deputy State Epidemiologist, Rachel Herlihy. ABC 4 easily found the national figures, but this information is not available for Utah's medical centers. Only hospitals administrators and Utah's Department of Health have access to the number of patients who get sick and die from bacteria and viruses in medical centers. Chest pains forced Michael Barker to the emergency room July 29. Open heart surgery with six by-passes saved his life. "The surgery went great. I had superb care during the surgery as well as after," said Michael Barker. Despite the high quality of care something went terribly wrong during his recovery in the intensive care unit. "That afternoon before I was supposed to go I started having chills and fever," said Barker. Tests revealed a potentially deadly prognosis and it had nothing to do with the open heart surgery. Somehow the microscopic bacteria, commonly known as MRSA, entered Michael's body during his intensive care recovery. "They supposed that it may have come from the IV. I don't know that anybody really knew...they just say they basically felt that MRSA's throughout the hospital. They haven't eradicated it and so it may have been on somebody's clothing," said Barker. His recovery took two months, powerful antibiotics and costly bills. On average healthcare-associated infections or HAI's increase a patients medical bill by more than $45,000. Michaels story is not unique. Hospitals are ideal breeding grounds for drug resistant bacteria like MRSA because they're full of patients on large doses of antibiotics. "Healthcare-Associated Infections, I think, have been an under recognized problem," said Herlihy. She says a growing number of state lawmakers across the nation are passing laws requiring hospitals to make HAI's public information. Five years ago six states required hospitals to publicly report HAI's. As of May 2010 the number has grown to 27. Utah is not included. "Don't you think disclosing this information especially listing the hospitals and their HAI rates would improve safety for patients?" asked ABC 4's Noah Bond. "It's difficult to say. The data is still really out on that. This field is pretty new," responded Herlihy. A nearly 50 page document titled "Lessons from the Pioneers Reporting healthcare-associated infections" confirms doctor Herlihy's reservations. It concludes page viii, "data collected so far are not sufficient to fully determine the laws' effects. As data accumulate, the incoming information will let researcher examine the effectiveness and consequences of different variations of healthcare-associated infection reporting laws." Herlihy says it is risky to compare hospitals with completely different specialties, patient populations and unique situations. She fears making the information public would discourage hospitals from recording HAI's at all. Her explanation is not good enough for hundreds of patients who enter Utah hospitals every year because the Federal Government is gave Utah $200,000 to prevent HAI's and because Utah's Health Department is already tracking and sharing this information with hospital chief executive officers, chief medical officers and nursing directors. Herlihy says hiding the names of hospitals prevents unfair comparisons, but some patients would like to see a day when hospitals can somehow standardize the way HAI's are recorded so that HAI rates could be reported the public. "It would probably motivate them perhaps to do a better job of solving their problems, said Barker. Lawmakers on the Healthcare System Task Reform Committee are not aware of any bills pushing for hospitals to publicly report HAI's. About three years ago lawmakers said they wanted to make the information public, but Utah's Association of Hospitals stopped the legislation. Lawmakers like Senator Peter Knutson would like to make HAI's public information. He thinks making the information public would push hospitals to save even more lives. KASESE, Uganda — For years, Charles Wesley Mumbere worked as a nurse's aide in Maryland and Pennsylvania, caring for the elderly and sick. No one there suspected that he had inherited a royal title in his African homeland when he was just 13. On Monday, after years of political upheaval and financial struggle, Mumbere, 56, was finally crowned king of his people to the sound of drumbeats and thousands of cheering supporters wearing cloth printed with his portraits. At a public rally later in the day, Ugandan President Yoweri Museveni officially recognized the 300,000-strong Rwenzururu Kingdom. Museveni restored the traditional kingdoms his predecessor banned in 1967, but has been adamant that kings restrict themselves to cultural duties and keep out of politics. 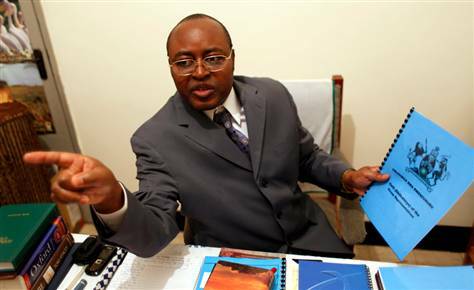 "It is a great moment to know that finally the central government has understood the demands of the Bakonzo people who have been seeking very hard for recognition of their identity," Mumbere told The Associated Press in the whitewashed single-story building that serves as a palace. Thousands walk to coronation The Rwenzururu parliament sits nearby, in a much larger structure made of reeds. It was here the traditional private rituals were held Sunday night and Monday morning to crown Mumbere king. Thousands walked several miles (kilometers) to see Mumbere, dressed in flowing green robes and a colorful hat, be officially recognized. People walked for miles to attend Mumbere's coronation. Old men clutching canes shuffled up the hill beside women in colorful Ugandan dresses called "gomesi." Among them was Masereka Tadai, 43, proudly overseeing practice for a march that retired scouts and girl guides would perform before the king. "Everyone is very happy because the president has accepted to come here and officially recognize the Rwenzururu Kingdom," Tadai said over a nearby drumbeat. The new King of Uganda's Mountains of the Moon has undergone many transformations — from teenage leader of a rebel force to impoverished student to a nursing home assistant working two jobs in the U.S., where he lived for nearly 25 years. Mumbere's royal roots only became public in Pennsylvania this July, when he granted an interview to The Patriot-News of Harrisburg as he was preparing to return to Uganda. Father died leading rebels He inherited the title when his father, Isaya Mukirania Kibanzanga, died while leading a secessionist group in the Rwenzori Mountains, otherwise known as the Mountains of the Moon. The rebels were protesting the oppression of their Bakonzo ethnic group by their then-rulers, the Toro Kingdom. The Bakonzo demanded to be recognized as a separate entity and named Kibanzanga, a former primary school teacher, as their king in 1963. "It was very difficult growing up in the bush," remembered Mumbere, who was 9 years old when his father took the family into the mountains. Although he received military training, Mumbere did not fight. "Our country has been independent (from the British) for 40-something years but in Rwenzururu you may not find running water, there are no hospitals," Mumbere said. Shortly after Kibanzanga died, his son led the fighters down from the mountains to hand in their weapons. Mumbere went to the United States in 1984 on a Uganda government scholarship, attending a business school until Uganda's leadership changed and the stipend was stopped. He gained political asylum in 1987, trained as a nurse's aide and took a job in a suburban Washington nursing home to pay his bills, said The Patriot-News of Harrisburg in a July 2009 story. 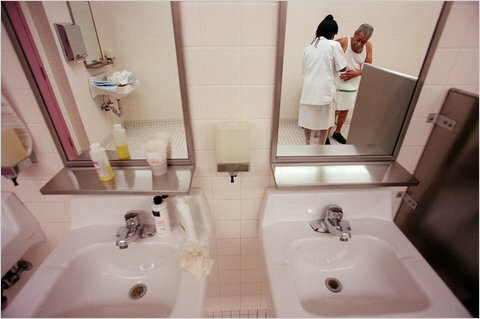 In 1999, he moved to Harrisburg, Pennsylvania's capital, where he worked for at least two health care facilities. Sought reliable job He was "very loyal, a very hard worker, a very private person," said Johnna Marx, executive director of the Golden Living Center-Blue Ridge Mountain on the outskirts of Harrisburg. Mumbere said he chose to train as a nurse's aide because the work "was more reliable. Other jobs you can be laid off easily." Living in the U.S., however, was "a very difficult experience," he said. "Sometimes you have two jobs. You go to college in the morning, between 8 a.m. to 12 p.m. Then you go prepare to go to work at 3 p.m. and then return at 11 p.m."
He is now a green card holder, and his son and daughter live in Harrisburg. But he never forgot the people he left behind. When the Ugandan government decided to reinstate the traditional kingdoms, Mumbere lobbied the Rwenzururu Kingdom to be among them. After 10 years of negotiation, President Museveni announced in August the government would recognize the Rwenzururu Kingdom as Uganda's seventh kingdom. Government recognition does not grant any executive power but allows the monarchs to determine cultural and social issues affecting their people. This is the story we were talking about in class the other evening. JACKSON, Ga. — A Georgia prisoner who tried to kill himself last week by slashing his arms and throat with a razor blade was executed Monday night amid heightened security for the 1998 murders of a trucking company owner and his two children. Brandon Joseph Rhode, 31, was put to death by injection at the state prison in Jackson. He was pronounced dead at 10:16 p.m. Rhode declined to speak any last words or have a final prayer. He was convicted in 2000 of killing Steven Moss, 37, his 11-year-old son Bryan and 15-year-old daughter Kristin during a burglary of their Jones County home in central Georgia. His coconspirator, Daniel Lucas, was also sentenced to death in a separate trial and remains on death row. Rhode's execution had been set for 7 p.m. but was pushed back several hours as corrections officials waited for the U.S. Supreme Court to decide on his plea for a stay of execution. The court rejected appeals later that night. Medics then tried for about 30 minutes to find a vein to inject the three-drug concoction. The prisoner's eyes darted around the room before the lethal mixture began coursing through his veins. Within minutes he was staring blankly at the ceiling of the death chamber. Moments before Rhode was pronounced dead he turned his head, exposing a bandage over the part of his neck he slashed. It took 14 minutes for the lethal dose to kill him. Rhode had initially been scheduled to be put to death Sept. 21, but the Georgia Supreme Court postponed the execution after Rhode was rushed to the hospital that day following a suicide attempt. Rhode was stabilized at a local hospital and placed in a restraining chair to prevent him from removing the sutures from his neck or doing any other harm to himself, state attorneys said. Defense attorney Brian Kammer countered that Rhode was put in a "torture chair" and subjected to cruel and unusual punishment. "He has been subjected to the surreal and incomprehensible: Heroic measures taken to stabilize his life by the prison staff that would then execute him," Kammer said in one court filing. Kammer urged the Georgia Supreme Court Monday to push back the execution again so experts could evaluate whether Rhode was mentally competent to be executed, or understood why he was being punished. He said Rhode lost half his blood Sept. 21 when he cut himself, went into shock and could have suffered brain damage. "The threat of execution has pushed Mr. Rhode's limited coping skills to the breaking point," spurring him to slash himself with blades he hid from guards while under a blanket, he said in the filing. Rhode and Lucas were ransacking the Moss' home in search of valuables in April 1998 when Bryan Moss saw them through a front window, and entered through a back door armed with a baseball bat, prosecutors said. They said Moss and his son and daughter were shot to death. Lucas later shot each of the victims again to make sure they were dead, according to the records. Rhode appealed the case several times, arguing that his trial attorneys failed to present enough evidence to persuade the jury to spare his life. Kammer argued more recently that his client should be granted clemency because doctors discovered he suffered from organic brain damage and a fetal alcohol disorder. Carol started teaching nurse aides in 1991 as a clinical instructor for Woods Cross High School. In 1995 when FHP hospital closed its doors Pioneer Valley Hospital was assimilating their employees and needed staff trained as aides. Because Carol had a background of teaching aides she was asked to arrange a class. Carol acquired the mandatory state education and began teaching C.N.A. courses. Life was so simple then! After teaching the classes requested by the hospital Carol didn’t give much thought to C.N.A. education until nursing homes started calling her requesting classes. She went around the valley teaching classes at nursing homes, carrying all the supplies in the back of her Nissan hatch back. As time went on she started teaching classes on site at Pioneer Valley Hospital. She was teaching one class every other month. In 1999 she asked Claudia if she wanted to help teach classes. Around 2002 classes started to pick up in frequency and the number of students attending. In 2003 ccCNA was official created. We moved to the old Doxey Hatch building across from St Marks. In 2005 we moved to Sugar House across from the library. That building was torn down in 2007. We spent another year in Sugar House before moving to West Jordan in 2008. A class that at one time was taught with the contents from the back of a car now takes three classrooms to contain! Over the years Carol and Claudia have taught thousands of students. One of the most asked questions is “don’t you get tired of teaching the same thing?” The answer is “no, like a snow flake every class is different.” While the content is the same the classroom dynamics are always changing. It’s always a new and unique combination of individuals. They are constantly updating our materials and the way we teach in an effort to improve the quality of education we provide and the pass rate of our students. Carol and Claudia are proud to have been the stepping stone for hundreds of nurses in the valley as well as doctors, respiratory therapist, physical therapist and other healthcare professionals. They hope to keep teaching long past the time most people retire. One of our students drew this picture of one of the residents at clincals dog.